Last weekend I had a super fun and inspiring weekend spinning yarn and eating great food (and drinking great wine) with my friend Lexi Boeger, Pluckyfluff, and the lovely ladies at the Atlanta workshop! The workshop was located on the property of a boarding school and alpaca farm! The alpacas were SO cute! Lexi got the best photo of them smiling! Rather than photos, I came home with a few of their fleeces! They are so soft and beautiful colors! I picked up Lexi in Atlanta and we went to a restaurant I’ve been wanting to visit for a long time. 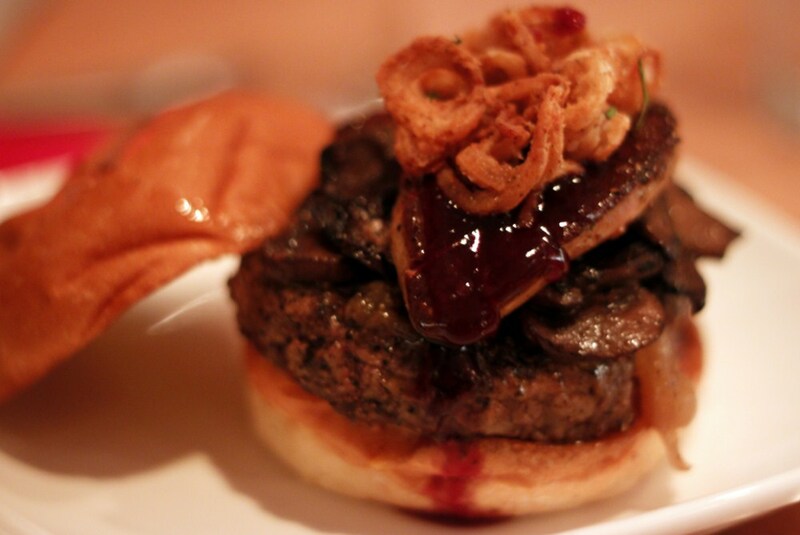 Flip Burger Boutique is the restaurant owned by season 8 Top Chef winner, Richard Blais. It was just as good as I’d imagined.. and the wait to get a table was less than 10 min on the late Thursday night when we went. We started with some Fried Pickles- had to give Lexi an immediate taste of the South. They were fantastic with the added sprinkle of fresh dill on top! I also indulged in one of Flip’s specalities- the Nitrogen milkshake. They keep metal spoons frozen in Nitrogen. When they pour the liquid into the shake glass, it freezes into the milkshake with the addition of a stir of the frozen spoon. The milkshake comes out with the spoon still “smoking” cold. 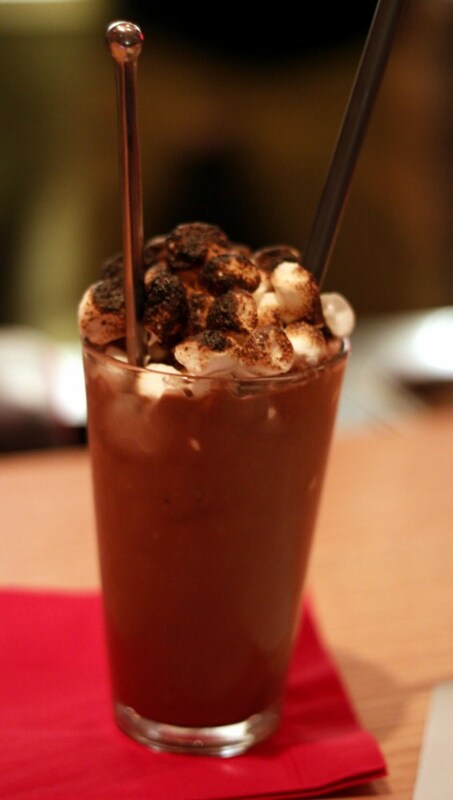 I got the Nutella shake with Burnt Marshmallows on top.. YUM! 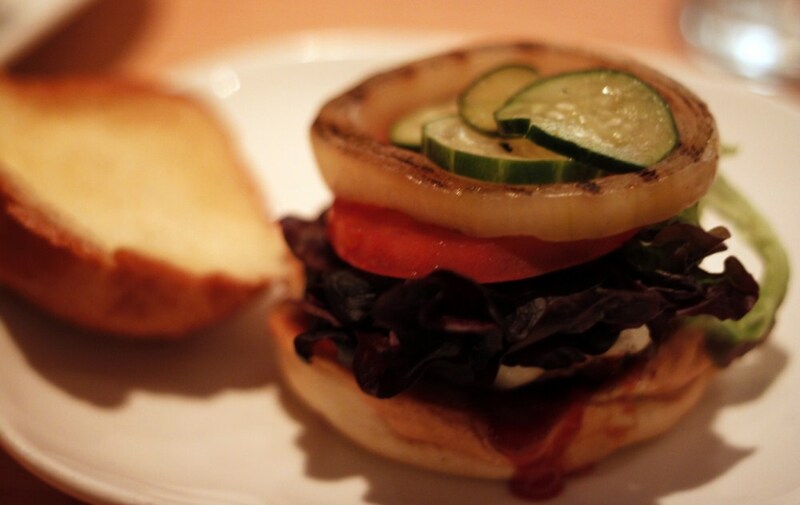 I got the “Farmer” burger, with the Grass Fed Organic meat (their burgers are all hand mixed of sirloin, chuck and short ribs), purple bib lettuce, bread and butter pickle, heirloom tomato, grilled onions, white cheddar, mustard and Coco Cola Ketchup. Of course they actually cook it to order.. so mine was red and juicy! Lexi got the D’Lux burger.. which is the Black Diamond beef, sauteed wild mushrooms, fried shallots, seared fois gras and truffle aoli! Also red and juicy! The buns are all fresh baked down the street. Can you smell it? SO GOOD!! Choosing was SO difficult- we could have probably eaten the entire menu! We decided to split the sides.. some yummy french fries (don’t know WHAT they did to give them the awesome crunchy texture.. but they were fantastic) with more Coca Cola ketchup. 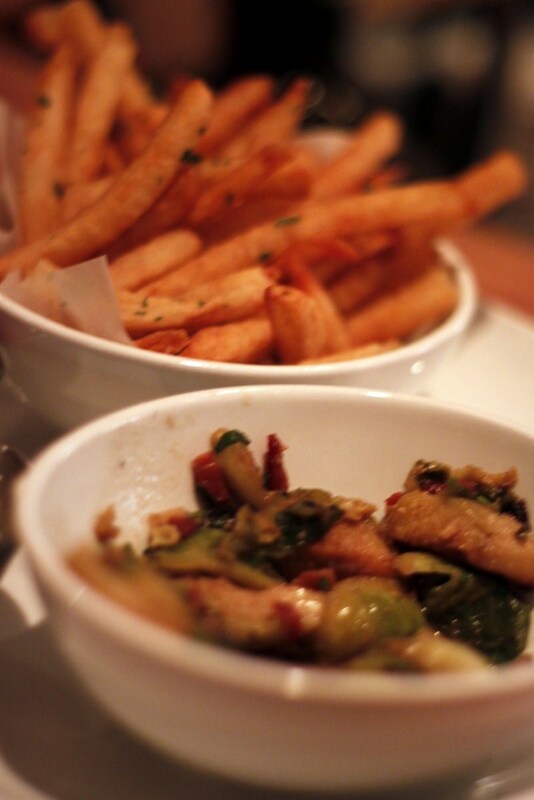 We also got the pan fried brussel sprouts with ginger and bacon. We headed to the farm after dinner.. glowing in the glory of our amazing meal. After my long drive and Lexi’s flights from California, we were pretty exhausted. We were asleep not long after we got settled into where we were staying! Terril had a lovely apartment set up for Lexi and there was room for me to crash as well! We set up the next morning with plenty of help from the workshop participants! There were lots of carders and not only did I have batts and add in’s available, Roo from Moonwood Farms had brought sparkle, add in’s and beautiful bags of loose fiber! Not only did we have an amazing sharing table, there was quite a shopping area as well!! We had a wonderful group of ladies from all walks of life! Some I knew from fiber shows and others were new friends! I love workshops like this because it brings together creative minded people to share and learn from eachother! Another wonderful thing that always happens is the “sharing table” people bring fiber and other things they don’t want/ know what to do with and share it with the group. Lexi always brings fun stuff from her stash as well! I cleaned my studio last week, so I contributed a big bag of carding scraps to this workshop and have plenty left to share with Raleigh in a couple of weeks as well! Lexi shared a lot of fun techniques! It’s so cool to see how her workshop has progressed over the years and how the techniques have morphed. Lexi is a wonderful teacher that inspires and encourages her students to expand their creativity. We were all very excited because one of the participants brought her copy of Lexi’s new book, Handspun; New Spins on Traditional Techniques; that was being shipped to preorders. It was the first sight of the new book that I had- and it was even MORE exciting for me since one of my extreme tailspun yarns is in the book! Not only did Terril and Michael (our hosts) make super yummy lunches each day (I MUST get the white chicken chili recipe that we had on Sunday. It was AMAZING!! ), they made an incredible meal for us on Saturday night! 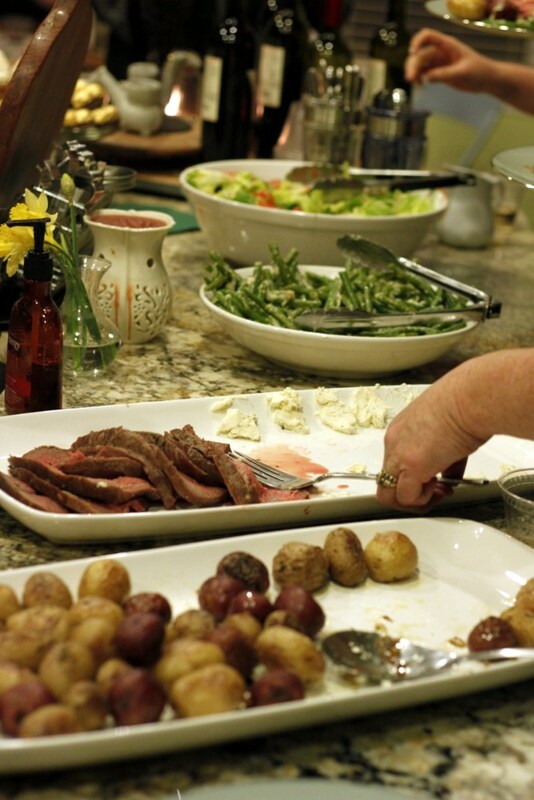 We were treated to such wonderful food, and it was paired with the most wonderful Boeger wine that Lexi sent. 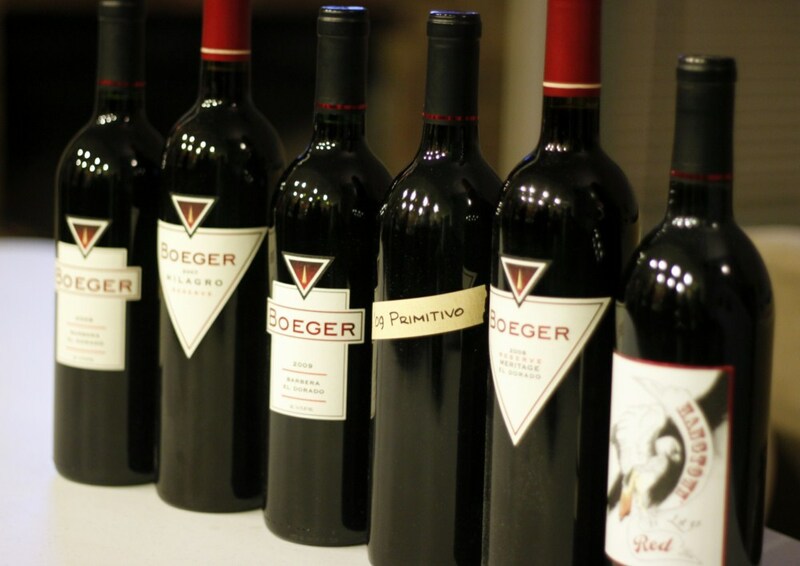 I am becoming a huge fan of the Boeger wines. I can’t say I’ve had one I don’t like! Not only did we have amazing food and company- we had a super fun “white elephant” game and I got to come home with beautiful hand dyed alpaca yarn from Terril! I think Lexi scored the most since she got the “Shepard and Sheep” Lego’s kit from Roo- not sure if her son Atom is going to actually get that or not.. LOL! Everyone was full and happy! Lexi was shocked and horrified that I’d never seen any of the Lord of the Rings movies, so we watched a bit of one that happened to be in the apartment.. (ok, yes, I haven’t seen any of them completely, but I am now inspired to watch them in their entirety! LOL!) The other ladies went off to spin- they had much more energy than we did.. and we heard them coming back to the house after midnight! Such partyanimals! Sunday was spent with more creative spinning. It’s such a wonderful inspirational space. 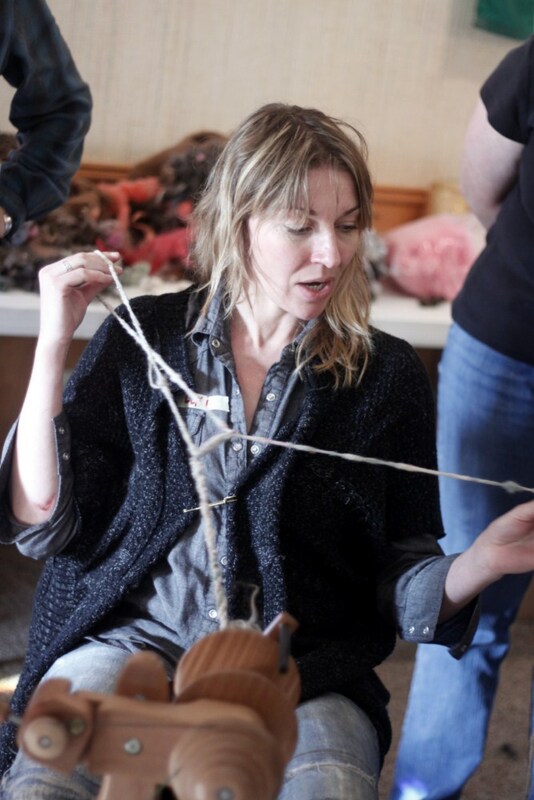 Lexi does a profound creative exercise that involves spinning “your brain” or “your heart” into a yarn. We included items that meant something to us in a special way.. and what was so amazing was then going around and listening to each person share their story. Spinning really does connect us all in such a deep way. 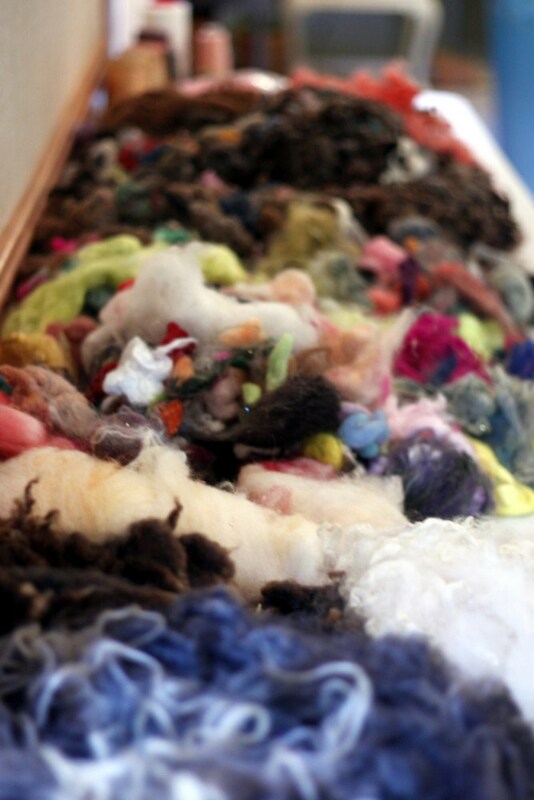 It was a really incredible journey and I’ll treasure the yarn I spun. 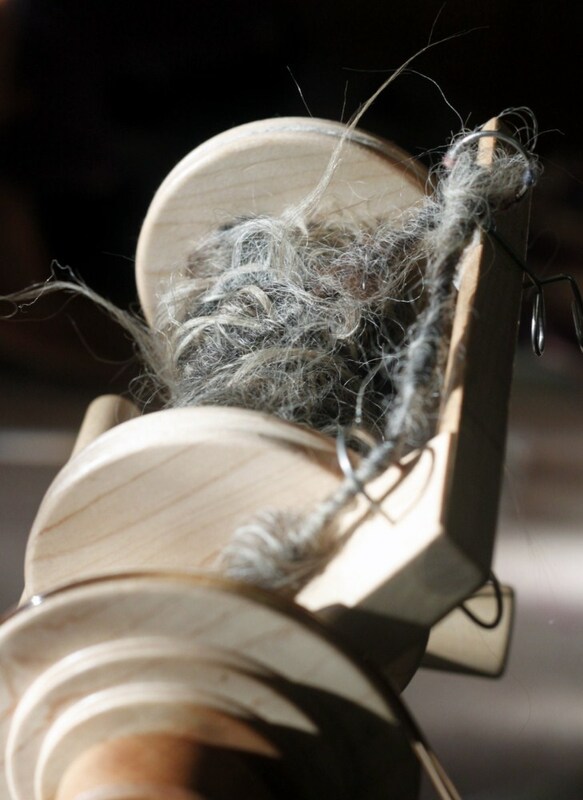 Lexi had me demonstrate the tail spinning portion of the workshop, which was super flattering. I used some amazing Islandic locks she’d given me earlier. This yarn was called “Gandolf the Grey” after the Lord of the Rings we’d watched the other night. I taught 3 methods of tailspinning and everyone seemed to pick it up. The end of the weekend seemed to come way too fast! Everyone packed up, gave hugs and were off for their trips home. I packed up my car-didn’t have the huge box of wine, but came home with 5 bags of fleeces.. so basically the same stuffed car! ha ha! I can’t wait until next year’s reunion workshop! Sunday night after everyone left Lexi and I went on a journey for dinner. The original plan had been Fox Bro’s BBQ.. but on the way we realized we were too hungry and we just couldn’t drive an hour from the farm.. so at that moment we passed a Joe’s Crab Shack.. so crabs it was! 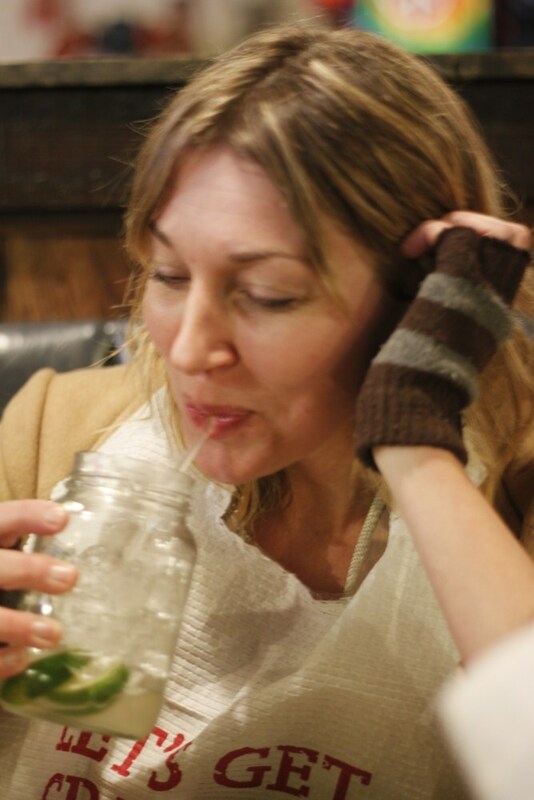 There’s nothing like ending an awesome weekend with bibs and drinks in jars! I had so much fun over the weekend! Hanging with old friends and meeting new ones! I enjoy teaching with Lexi. We have such a similar teaching philosophy and methods.. We work very well together. Maybe you’ll be seeing some PluckyTurtle/JazzyFluff dual workshops in the future…. Can’t wait for her to come here in a couple of weeks! Joint trunk show on Friday Feb 17 and a workshop on Sat and Sun all at Downtown Knits, 122 N Salem St Apex! Please if you’re in the area, come by!! On Friday night Lexi will be signing her new book and we’ll have wine from the Boeger winery! We’ll have yarns available as well! We can’t wait to see everyone! I can’t wait for another wonderful, inspiring, creative weekend- this time with my local fiber buddies and besties coming from out of town! ← Thanks Vogue Knitting Live & NYC! We’ll be seeing you again soon! Darn, wish I’d known, I would have delivered the 3 bags of scraps I have for you! It was a great weekend…..can’t wait to get together again soon. We are very excited for your visit at the end of February, Esther! Hope you can share some of the stories with us. Hugs from everyone at Alpaca Yarn USA!